Diverse data gathering, robotics and automation leads to digitized underwriting. Complex rules algorithms, analytics rules engines or judgement to triage risk and decide the correct underwriting path. Yet underwriting is vulnerable to bad and incomplete data which is the potential bane of all digital transformation. In the excitement of embracing machine learning, robotic process automation (RPA), AI it is easy to forget the discipline and attention to detail required in data management. Take a schedule of hundreds, thousands, tens of thousands of properties typically described in unstructured data schedules. How do you access and analyse that? Manual analysis?- I can across a schedule of 20,000 properties held as current risk which would take 8 weeks to analyse with ample scope for error. Too late and too inaccurate. Or access each property data set, turn into a semi-structured XML stream and plot longitude & latitude to visualise on Google Maps. Location intelligence visualises that against other data sources, internal & external, to be able to judge risk better. But that needs the tools to transform unstructured to semi-structured data and then analyse to deliver the insight for better decision making i.e. underwriting. It is surprising how little has often been known when risk is accepted and underwritten. All the machine learning and AI in the world will not help if you cannot access and analyse the data which is often more the case than not. A false sense of security pervades the underwriting team when the wonders of AI hide unpleasant truths which may raise their ugly heads later. It's not in any way to undermine the article below it's just to add a major aspect often misunderstood and forgotten. "The high performers of tomorrow are going to be the ones that figure this out first. They will choose the customer segments, channels, and product offerings in which they want to compete. They will then adapt every other aspect of the underwriting ecosystem to deliver superior services and solutions that are profitably priced to the market." Am I thinking about my underwriting process from the outside in? 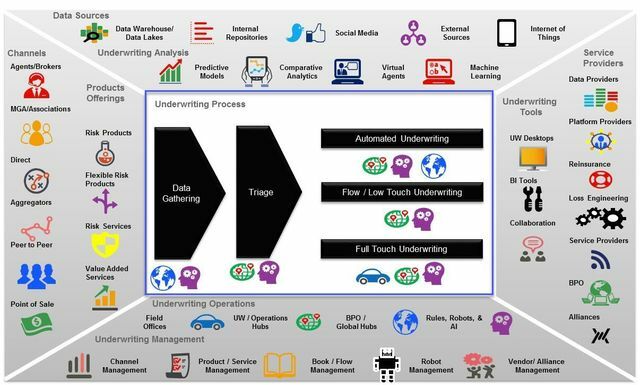 Have I considered or thought about all of the aspects of the evolving digital underwriter ecosystem? In a simplified underwriting process, there are two steps: data gathering and triage. Data gathering is where we collect the information necessary to underwrite the risk. Today, the data gathering process is transforming in a number of ways. We now collect data directly from the customer and can integrate large amounts of external data into the process. This limits the information we need from the insured while providing more complete information for the underwriters. In the digital landscape, underwriters gather data through various channel portals or, if submitted through traditional submissions, can handle it offshore or through the use of robotics and automation.